Photo Credit: Andrew Brown, Department of Parks and Wildlife. 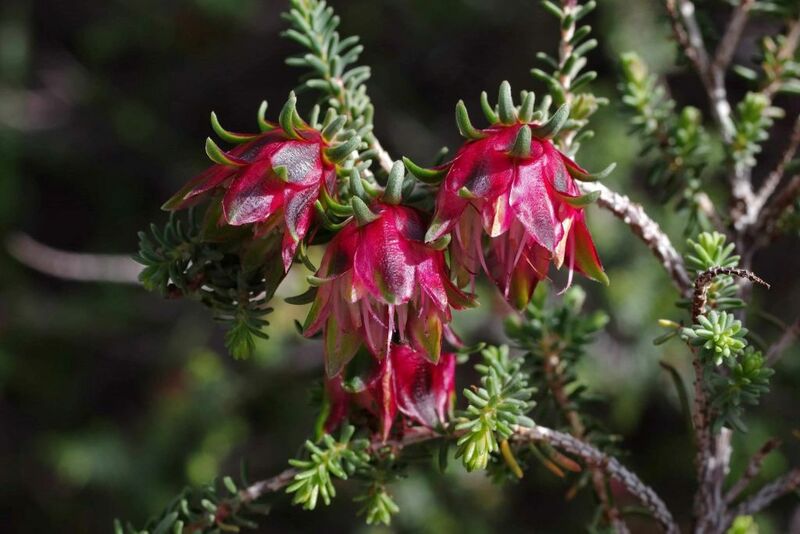 Darwinia polychroma is listed as Endangered under the Commonwealth Environment Protection and Biodiversity Conservation Act 1999 (EPBC Act) and as Declared Rare Flora under the Wildlife Conservation Act 1950. 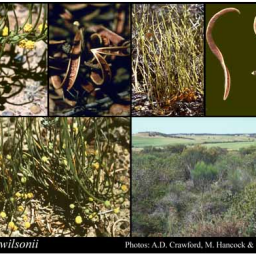 The main identified threats to Harlequin Bell include loss and fragmentation of habitat; competition from weeds and grazing by feral rabbits. The main potential threats to Harlequin Bell include accidental destruction from road and railway maintenance; and trampling and grazing while sheep are being moved. Darwinia polychroma also known as Harlequin Bell, is a dwarf shrub growing to 1.2 m tall with simple, keeled leaves 3 to 4 mm long and 1 mm wide. Bracts are broad and coloured green, red and yellow, and form a bell about 1–2 cm long containing several tubular flowers. 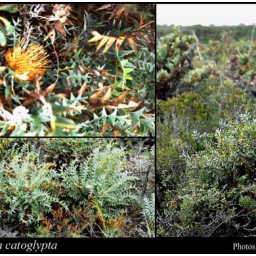 Harlequin Bell is restricted to a 10 km range in the Carnamah area of WA. There are three known populations of the species, found mostly on road or railway reserves, with part of one population on private property. None of the known populations is protected in a conservation reserve. 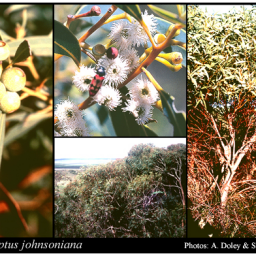 This species occurs in open low scrub or shrubland with Melaleuca sp., Acacia ligulata, mallee (Eucalyptus sp.) and Exocarpos sp., on yellow loamy sand over laterite. Darwinia polychroma was previously named Darwinia sp. Carnamah.